a nonpartisan journal devoted to the analysis of American politics. This Monday, Meet The Press and This Week. 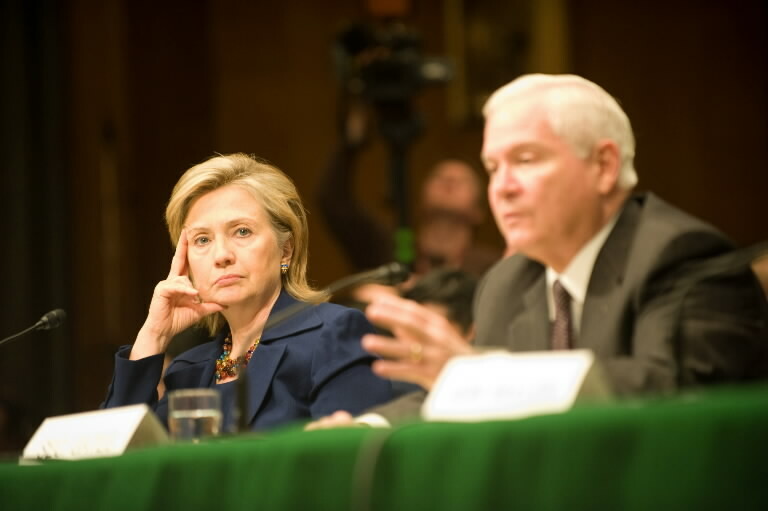 In short: The White House’s defend-President-Obama’s-Nuclear-posture-review-effort was headed by Secretaries Clinton and Gates, and the roundtables’ focused on the upcoming replacement of Supreme Court Justice John Paul Stevens. It will … be someone who, like Justice Stevens, knows that in a democracy powerful interests must not be allowed to drown out the voices of ordinary citizens. My first reaction was that Obama was talking about a nominee who would oppose the Supreme Court’s ruling in the Citizens’ United case since President Obama framed his opposition to that ruling in strikingly similar terms. Now, who will Obama pick? The shortlist includes about ten names, including the following: Judge Diane Wood (7th Circuit U.S. Court of Appeals), Elena Kagan (the solicitor general of the United States), Judge Merrick Garland (judge on the U.S. Court of Appeals in the D.C. Circuit) and Secretary of Homeland Security Janet Napolitano. Kathleen, you write in a column this morning about this complicated relationship with allies like Hamid Karzai in Afghanistan. And, again, you saw that exchange. What was noteworthy is a shift in the administration. Here you had the secretary of Defense and the secretary of State saying, “We’re not going to react to some of these things. We’re going to be more sympathetic toward Hamid Karzai. He’s the guy that we have to deal with.” That was, that was a significant change. Yeah, that was a shift as of right this minute, right? We’ve been pretty hard on him, and he is the guy that was elected and he is our man. We, we created Karzai. And he’s been under siege from everyone. I mean, Obama pretty much came out swinging during his campaign, and he’s had, you know, every European parliamentarian coming after him. Everybody is on Karzai’s back. And, and naturally, he’s going to react. This is the testosterone axis of the world, and you don’t insult a leader in public and then expect him to just sit back and take it. MR. BROOKS: You’re turning to the party of “maybe” over here. So this is a bad move for you. Listen, Palin is great TV. She’s really attractive. Gingrich is sort of great TV. He’s got a billion ideas, 600 of which are really good. But the fact is the, the Republican Party is not Palin and it’s not Gingrich. The Republican Party is Rob Portman, who’s running for senator in Ohio. It’s Mark Kirk, who’s running for, for senator in Illinois. It’s Governor Christie in New Jersey. These are the people who are actually governing. And I happen to feel we pay a little too much attention to people like Palin, who’s sort of a sub reality figure on some TV show. But these are the people that are actually running, and they’ve actually got it figured out.They’re against a lot of what Obama’s doing, but they’re the party of “yes.” They’ve got a whole series of policies. Paul Ryan from Wisconsin has–can wonk your ear off. And so that’s the real party. Palin, the tea parties–listen, the tea party movement is a movement without a structure, without an organization. No, no party, no movement like that lasts. On This Week, the Roundtable focused on Justice John Paul Stevens’ retirement, and George Will’s opening remarks emphasized the fact that the confirmations of Supreme Court nominees were much smoother and went much faster back in the good old days. Furthermore, and as host Jake Tapper pointed out, the confirmation of Justice Stevens was the last one that wasn’t televised. Perhaps it was easier to be bipartisan when the voters weren’t watching? I happen to feel we pay a little too much attention to people like Palin, who’s sort of a sub reality figure on some TV show. If it’s Monday, it’s Sunday talk show highlight time. Postscript: Cokie Roberts mentioned the cartoon we picked as “Political Cartoon of the Week, April 4-10” when she described the upcoming debate on President Obama’s Supreme Court nominee. Who Gets What is a nonpartisan journal devoted to the analysis of American politics (READ MORE).